Last week, the Hadassah Foundation held its first-ever parlor meeting! 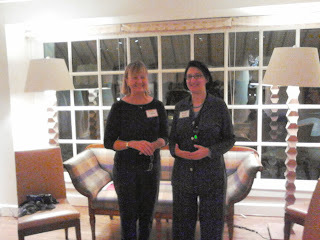 Board Member Karen Herman, left, graciously opened up her home to a group of enthusiastic guests. We showed the Foundations's video (which you can view at www.hadassahfoundation.org on our homepage), and introduced our Israeli grantees via short clips we had posted on our YouTube channel (www.youtube.com/hadassahfdn). The attendees learned about our work both here and Israel, and how smart investments can make a real difference. We are fortunate in that our endowment covers our overhead and some of our grant making, but to have greater impact, we want to increase the amount we give away each year. Since our overhead is already taken care of, all donations go directly to our grantmaking!